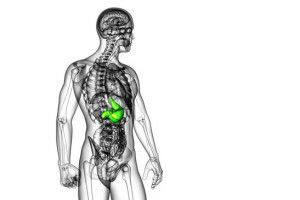 Hereditary diffuse gastric cancer is an autosomal dominant cancer predisposition syndrome. In addition to gastric cancer, up to 60% of female mutation carriers develop lobular carcinoma of the breast, and some carriers may develop colorectal cancer. Hereditary diffuse gastric cancer (HDGC) and lobular breast cancer (LBC) are caused by heterozygous germline mutation in the E-cadherin gene (CDH1). HDGC is distinct from the more common sporadic occurrence of gastric cancer, which can be associated with environmental factors, such as Helicobacter pylori infection*, high-fat diet, or smoking. Also in these patients CDH1 mutations can be found, but not in all body cells (germline mutations), rather in cancer cells only (somatic mutations). *Helicobacter pylori infection is the strongest known risk factor for this malignancy. An important goal is to identify H. pylori-infected persons at high risk for gastric cancer, so that these individuals can be targeted for therapeutic intervention. Because of this, attempts have been made to identify genetic traits of the bacteria itself which may increase or reduce the risk for gastric cancer. It has been found that the risk of gastric cancer is very low among persons harboring H. pylori strains that lack a 40-kb chromosomal region known as the cag pathogenicity island (PAI). Because gastric cancer is very diffuse, several studies have been made to characterize genomic and epigenomic pecualriaties of tumor cells in the aim to find pathways for specialized and personalized treatment (personalized medicine). So far four molecular subtypes of gastric cancer have been identified, which are classified as Epstein-Barr virus-positive, microsatellite instability, genomically stable, and chromosomal instability subtypes. Loss-of-function of ARID1A may be involved in the tumorigenesis of EBV-positive GCs. In addition to ARID1A, EBV-positive GCs have frequent mutations in PIK3CA and BCOR. Several copy-number variations (CNVs) have also been detected (e.g. frequent 18q loss and 9p24.1 gain). MSI-high GCs may account for up to 24% of gastric cancer patients. MSI is associated with an absence of DNA mismatch repair activity. In such tumors mutations have been frequently found in B2M, TP53 , ACVR2A, PTEN, PIK3CA, KRAS, ERBB2, ERBB3, RNF43, ZBTB1, TRAPPC2L, GPR39, GPR85, KRAS, ARID1A, HLA-B and CHRM3. Genomically stable gastric cancer is characterized by enrichment of diffuse-type GCs, a relatively younger patient age at diagnosis, and low mutation rates. Genomically stable GCs have frequent mutations in ARID1A, CDH1, and RHOA. RHOA fusions can also be found, including RHOA-COL7A1, RHOA-GPX1 by deletion, and RHOA-RBM6 by inversion. This subtype is characterized by a high frequency of chromosomal copy number variations. Enrichment of TP53 mutations and recurrent chromosomal amplifications and deletions is typical (TP53 mutations actually cause chromosomal instability) as well as the genomic amplification of receptor tyrosine kinases (RTKs). The EGFR, ERBB2, ERBB3, FGFR2, MET, VEGFA, and KRAS may be frequently found amplified. Trastuzumab, an anti-HER2 monoclonal antibody, may be an therapeutic option for gastric cancer with somatic ERBB2 amplification. Other frequently amplified genes in chromosomally unstable subtype of gastric cancer include MYC, GATA4, GATA6, CCNE1, CCND1, and CDK6, whereas frequently deleted genes are FHIT, WWOX, STK3, CDH1, CTNNA1, PARD3, and RB1. Posted in Academia, Disease cards, Last Update, Medical Genetics, Personalized Medicine and tagged gastric cancer, hereditary diffuse gastric cancer, personalized medicine, sporadic gastric cancer.